My first vocation was that of a pastor. For 21 years, I served churches in California, Texas and Oregon. All the while I continued to develop my musical skills as a pianist and songwriter. When the Soviet Union began to implode in the mid 80’s, I started visiting Latvia, first to provide encouragement and assistance for relatives. In 1994, I founded Bridge Builders International (BBI), a charity that builds partnerships between the US and Latvia to multiple areas of Latvian society…educational, spiritual, economic, health care and leadership development. I was thrilled. Two months later I began to study with Naumovs. A few months later, I began to study with the renowned Latvian master, Kaspars Zarins, also a professor at the Latvian Art Academy. Since I am a theologian, some ask me if I paints for religious purposes. I believe I was made in the image of God who is the author of creativity and beauty. When I use my creative gifts to make something beautiful, I believe that God is pleased. I want everything I do, including painting, to honor God. I don’t have to paint religious themes to communicate the life, joy, creativity and beauty that God has given me. This means that I am free to embrace and express beauty any way I feel. This freedom is a gift from God. Artistically, I have created more than 400 paintings since 1994 and have had numerous exhibitions in the USA, Latvia and Estonia. My works are in private collections in many countries around the world. I love bringing people together so it was natural for me to begin inviting artists to come together for relationship, professional and spiritual growth and strategic purposes in 2013. This has led to the establishment of the Imago Dei Artist Network in Latvia and the annual imagiNATIONS Artist Festivals in both Latvia and Estonia every summer. I also lead a network of European artists from 22 nations who meet annually in Poland at the European Leadership Forum. I have been married to Nancy for 41 years. We have four grown children and nine grandchildren. 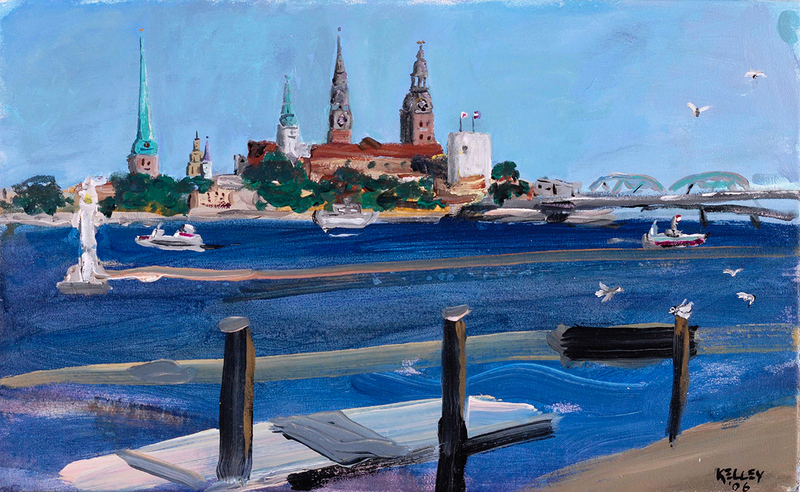 The painting above is: Pearl of the Baltics by Charles David Kelley, © 2006.